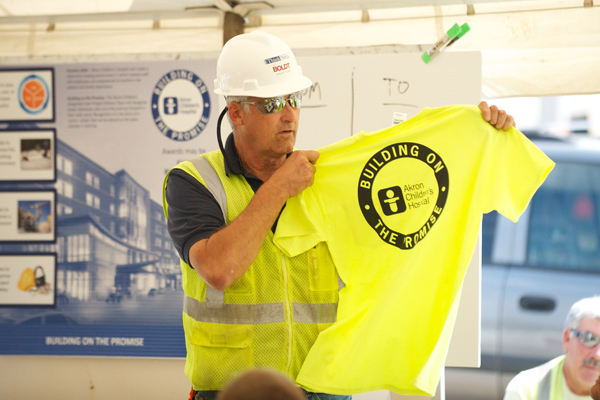 Construction workers for Akron Children’s new medical tower affix stickers of the hospital’s iconic logo symbol to their hard hats as symbols of their successes and teamwork. Great coaches like Woody Hayes know that a little extra motivation can go a long way when a big game is on the line. That’s why, according to Ohio State football lore, he started giving buckeye leaf stickers to players 45 years ago. 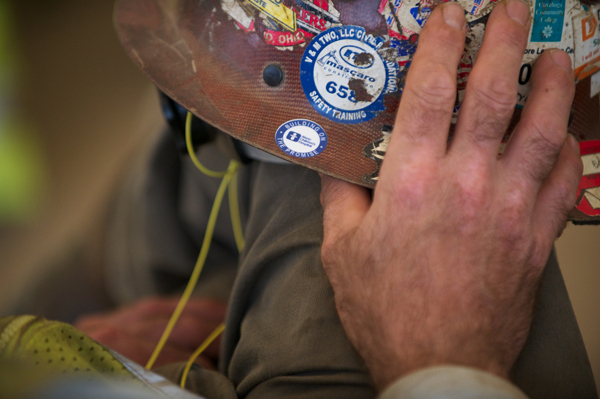 Taking a page from the legendary coach’s playbook, the construction crew has started a helmet sticker recognition program of its own. 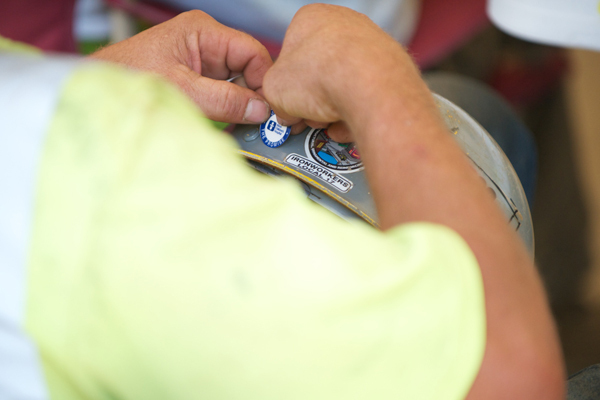 Much like the football players sport buckeye leaf stickers on their helmets, the workers are affixing stickers of Akron Children’s iconic logo symbol (aka “the bambino”) to their hard hats as symbols of their successes and teamwork. 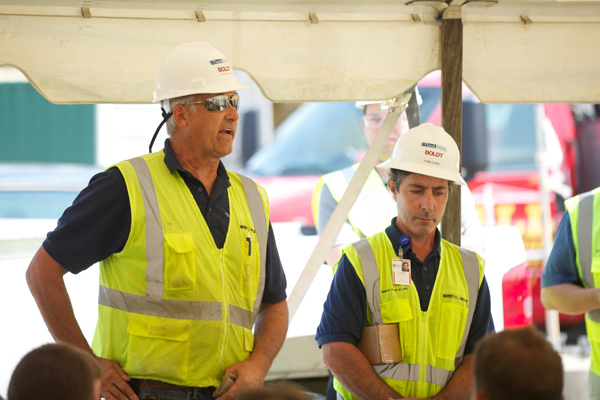 Welty/Boldt leaders Chuck Voigt, project safety director, and Tom Conti, superintendent, present the awards weekly at the Tuesday safety meetings. The idea for the Bambino Program came from the construction education committee, comprising Loughrin, Bernita Beikmann, of HKS, and Will Lichtig, of Welty/Boldt. New members of the crew also receive a welcome package when they go through the mandatory safety orientation. The package includes a number of safety items, including a yellow vest with the Akron Children’s logo on the back. 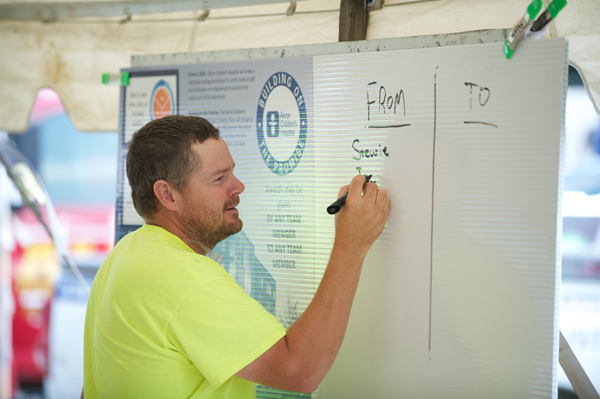 “We want to reinforce that we are ‘one team’ from the first time someone steps onto our project,” Loughrin said.